No. 37, Jalan Metro Perdana Barat 7, Sri Edaran Industrial Park, 52100 Kepong, Kuala Lumpur, Malaysia. 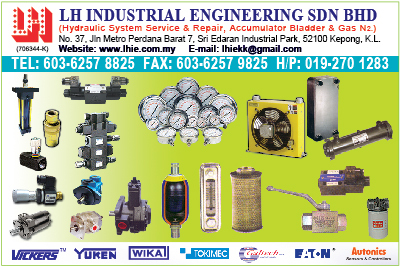 LH Industrial Engineering Sdn Bhd is a company that specialized in: Pneumatic Components and accessories, Pressure Gauges, Pumps, Pressure Switch, Level Gauges, Directional Valve, Filter, Cylinder, Accumulator and Cooler. We have been in the market for more than 10 years and we have good connection with many supplier. Apart from that, we also supplies equipment for machinery equipment, hydraulic equipment and hardware such as pneumatic equipment component. 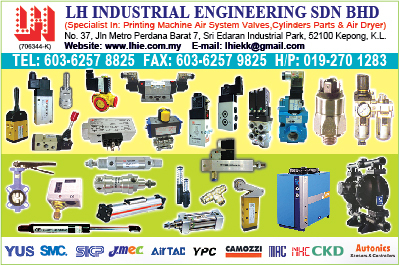 Our company provides the ultimate solution for PLC control, Pneumatics & Hydraulics Control system, Hose & pope assembly specialist. We are proud to associate company with other well-known supplier such as Yuken, Vickers, YUS, SMC, ORIGA, HERION, NHC, DOFLUID, CAMOZZI, CKD and J.MEC. We are constantly looking to improve ourselves and making sure that we provide the best solution to our customer.